On a cold summer day in February, I looked up from the lake to see a man descending a zigzagging trail. He walked lightly across loose boulders to the water’s edge, where a large ruler pierced the surface. He read it, and then turned to climb the switchbacks back to the hut, where a radio was wired to what looked like a car battery. It was his job, shared with two other men, to report on the status of the water levels every two hours, day and night. The man introduced himself as Víctor Morales, one of the guardians. I followed him up to the hut, where we listened to the rumble of falling ice echoing repeatedly off the high walls around the lake. Seeing me jump as yet another distant waterfall of white tumbled down, Morales laughed and said in Spanish: “Little! Just a little avalanche.” He would mark the activity on his next report, he said, as “minimal,” far less than the fall two weeks before, which raised 12-foot waves in the placid lake. That one he described, with a shrug, as “regularcito.” Should a more substantial avalanche happen, something that researchers consider a significant risk, the resulting flood would careen down the valley, overwhelming houses and farms until it arrived in Huaraz. According to the best available estimates, even without a collapse of the glacial moraine, a wall of rock that serves as the lake’s natural dam, which is considered unlikely, a large avalanche could lead to the inundation of 154 city blocks and more than 6,000 deaths. The regional government has considered various solutions: lowering the lake level by another 60 to 100 feet; creating a more technologically advanced early-warning system with sensors and sirens; plastering the city with evacuation maps. “We want a map in every schoolchild’s notebook,” César Portocarrero Rodríguez, an engineer and glaciologist in Huaraz, says. 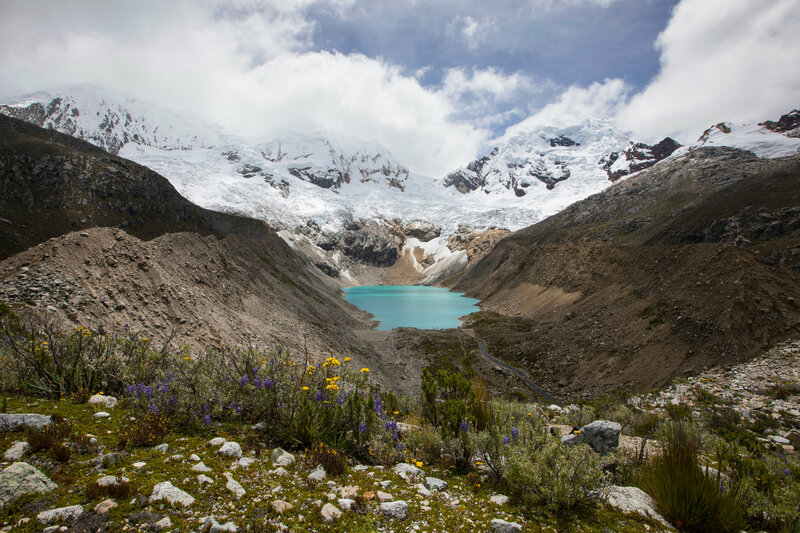 One day, five years ago, Luciano Lliuya sat talking with a friend about the many changes and costs that climate change is bringing to the Andes, whose residents have, by global standards, done very little to contribute to the problem. “We wondered,” he said, “whether we could find los responsables” — the responsible ones — and somehow persuade them to change their behavior. He wanted, fervently, to find a way to stop the ice from melting even more. Luciano Lliuya’s friend introduced him to a contact at a nongovernment organization called Germanwatch, based in Bonn, that works to promote equity between developed and less-developed countries. In 2015, with the group’s support, Luciano Lliuya, who had never left his country, traveled 6,500 miles to file a lawsuit against RWE, Germany’s largest energy utility. The lawsuit claimed that the company, though it does not operate in Peru, had contributed about half of 1 percent of the emissions that are causing the global climate to change and that it should therefore be responsible for half of 1 percent of the cost of containing the lake that might destroy Luciano Lliuya’s house. His claim entered the courts in the form of a demand for $19,000. Legal systems have long struggled with the best way to respond when individuals have been harmed by others. Who qualifies as a victim, and what counts as a misdeed? How can harm be traced and measured? If it can’t be undone, what might make things right? Nearly 4,000 years ago, the Code of Hammurabi decreed harsh restitution for dozens of situations. If, for example, someone failed to maintain his dam and it failed, flooding a neighbor’s fields, the negligent dam owner should “be sold for money, and the money shall replace the corn which he has caused to be ruined.” Anglo-Saxon law offered wergild, set amounts to be paid by offenders to the families of their victims, in atonement for murder or adultery. In seventh-century Kent, the lives of freemen were valued at 100 shillings, noblemen at 300. In the modern era, common-law countries such as the United States have turned to the courts to sift through the complexities of injury, causation and remedy. Common law, as distinct from statutory law, applies in situations where no legislative guidelines have been set and courts instead respond to cases as they happen — leaning on, and adding to, centuries of accumulated decisions interpreting the basic legal idea that individuals have uninfringible rights. Modern cases that take on environmental damage rest on a heritage that includes, for example, William Aldred’s complaint, in the early 1600s, that the stench from a pigsty built by his neighbor Thomas Benton made his home unbearable.